Photo by Carol King used under Creative Commons license. Best fried chicken in the Universe? I absolutely think so. I, as a Bethany native, have been to the Chuck House numerous times growing up, having lived near its location on NW 10th street just past Meridian (4430 NW 10th St, Oklahoma City, OK 73107). I can’t find any chicken fried steak that compares. 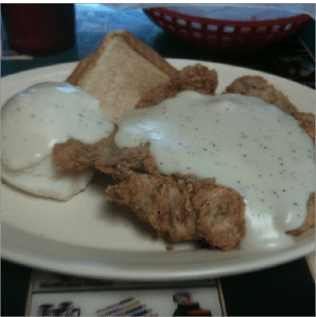 For $6.09, you get the famous chicken fried steak meal which comes slathered in white gravy with texas toast and your choice of french fries, mashed potatoes and gravy or a baked potato. I’ve subbed fried okra before, and that was incredibly delicious as well. This price does not include a drink. Honestly, I haven’t tried anything else on the menu because why mess with a good thing? This meal is certainly not healthy, but you can add a few nutrients by ordering a trip to the salad bar ($3.49) or unlimited trips ($4.99). This restaurant is quite run down. The tables are covered in advertisements, and the walls are brick and wood paneling that has no urban appeal. It used to have an alien theme, which I thoroughly enjoyed as a child. Then they had pictures on the wall of limes that were cut open, the insides looking like a tomato. Now, it has unmemorable old timey photos on the wall–an attempt at the “home sweet ‘homa” trend. However, it does have hole in the wall charm. Take your date here to find out how adventurous he or she is. The Chuck House has a fun gimmick, you order by a phone at your table. Then, the staff buzzes your phone when your food is ready. Then you pick it up at the counter and pay for your meal. Since there is no table service, no tipping is required. The Chuck House is open Monday through Sunday, 10:00 a.m. to 9:00 p.m. It is a delicious and affordable way to satisfy your chicken fried steak craving, so brave the facade and give it try. Please let me know if you try any other menu items.